Did you know that Wolverhampton is twinned with Venice? Perhaps it is something to do with the canals. Although I think that Venice would win by sheer numbers on that one. One thing, however, that Venice would definitely not win on though, is the hog roast! Taste the Cracklin hog roast in Wolverhampton is the best party to have with or without canals. A Taste the Cracklin party is a most splendid affair. We are consummate professionals in all that we do. Blowing our own trumpet? Well, yes! Because you won’t have seen anything like it. That is always impressive. And it is the centre piece of all events in Wolverhampton. But there is also plenty more besides. I’ll tell you about that in a minute. First of all I would like to tell you more about how we go about things. When you hire Taste the Cracklin, you’re hiring an catering company run by a group of enthusiastic, friendly helpful people who love their work. We set up nice and early so as to make sure that everything is ready in good time. Because one of the best things about having a hog roast is that we prepare and cook everything that we serve right there on site. Absolutely nothing is pre-prepared and brought in. Fresh! Fresh! Fresh! is our ethos. And that is what we deliver no matter what size of event you are having. We can cater just as easily for 3000 as we can for 30. We just bring more! So, whether we are setting up in a corner of your garden for a nice, cosy family shindig, or building a string of gazebos to house our kitchens for a huge event the same array of wonderful food and great service is laid on. As I mentioned before we supply a fantastic array of food. 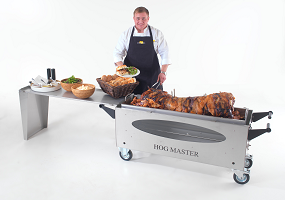 At a hog roast party you are, of course, going to get a hog. Which means plenty of pork. But also other meats like beef and lamb which are always beautifully accompanied by fine salads and vegetables. And the deserts! Oh, the deserts! Oh yes, and before I get all carried away thinking about them we also prepare superb vegetarian dishes. So much to choose from. You will be happily stuffed to the gills.It is all well and good delivering stunning food but there is more to the service at Taste the Cracklin. Not only do we get an early start for preparation, we also make sure that when our part of your day is all done and dusted, we clean up and clear out with no fuss or bother. We do not want intrude on your party. We see the clear up as important as any other part of the service we provide. So, you won’t even know that we were there. Apart form the happy full tummies.